Soon after I started making pots (1976) I went to live in Japan for a while. The big lesson I got there was about letting the material speak. Clay is malleable and sort of fleshy which is perhaps why humans have such an affinity with it. The potter can bring out the life of it and make it breathe. This is what I’m after with every pot. I love to make pots for use. 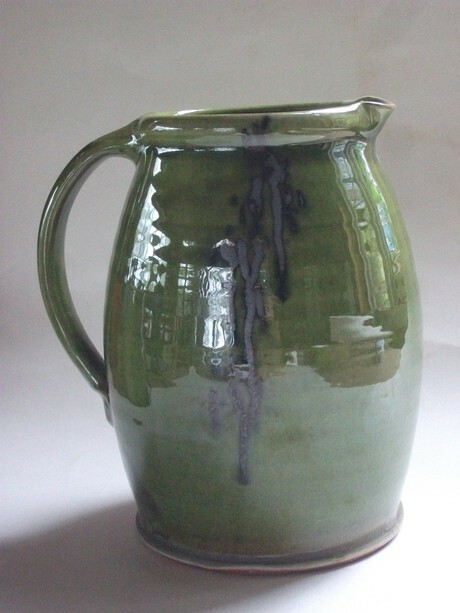 The possibilities are really endless for fecund jugs, deep or shallow bowls, generous dishes etc. Slipware has been made for centuries across the world: pots made with the readily available red or buff clays, decorated with rarer white or coloured slip and fired up to 1100°C (rather than the more difficult and costly stone or porcelain wares at 12-1400°C). I find these old, easy-going primitive and peasant pots are very inspiring. Sometimes I brush the slip on, which lets some of the red clay colour through. I have cream, green and turquoise slips, and blue, green or clear glazes. I particularly love the contrast of red and green which so abounds in Devon. All my work is for everyday use and safe in the oven and dishwasher.